Flowers! I never really appreciated flowers while I was growing up. My deep connection did not come till much later when I began to garden extensively. And it was years after that that I discovered how truly magical they are. I was first introduced to flower essences in 2006. It was a new concept for a newly awakening Caroline, but one that totally lit me up. My Reiki master at the time encouraged me to purchase ones from a popular farm and I did, but they were boring and flat to me and reeked of alcohol. There was another farm that was calling to me – Green Hope Farm in Meriden, New Hampshire. My heart knew where to guide me and I listened. Molly and Jim Sheehan own Green Hope Farm. It is where they raised their four children and where Molly and her staff work co-creatively with the Angels and Elementals of the farm. They guide her in setting up the gardens, in creating just the right combination of flower essences, and in running her business. Years ago there was a raid on Green Hope Farm and the police came and seized all of Molly’s flower essence bottles. At that time, she was using alcohol as a preservative in her essences, as is the usual practice. If you have ever been to New Hampshire, then you know that only the state can sell alcohol and Molly was in violation. The Angels explained it was all part of a bigger plan. They instructed her to plant Red Shiso, a member of the mint family, and use it with vinegar to preserve her new line of essences. This system worked beautifully with the Shiso acting as a stabilizer and giving her essences a lovely red glow. Flowers contain wisdom which is then transmitted into water and stabilized with the Red Shiso. When consumed orally, spritzed on the skin and air, or bathed in, this wisdom is shared on an energetic level. Our electrical system can then learn from this vibrational wisdom and develop new patterns, new ways of experiencing challenges, new ways of tapping into our creativity, and new ways of connecting more deeply with our own inner truths, thus moving forward on our journey in a more empowered and authentic way. Flower essences contain electrical information, are safe for animals and people to work with, and do not interact with medicines. 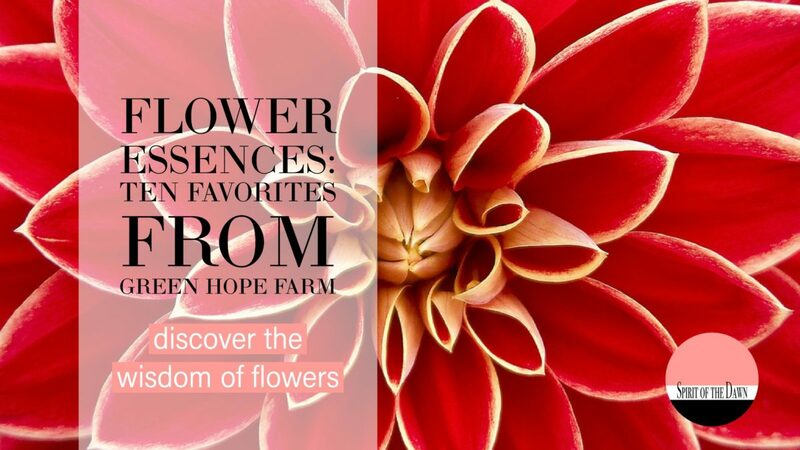 Molly’s business has grown considerably through the years as has her amazing collection of flower essences from the farm and from all over the world. I have worked with these essences for many years with clients, with my family, with our animal family members, and with myself. I love all of the essences and today we will explore ten that I have worked with extensively. Flower Essence Descriptions from greenhopeessences.com. Golden Armor provides information to our electrical systems about how to buffer and protect us from computer screens, radiation and atmospheric changes, aberrant astral energies, human negativity, dissonant sounds, viruses, bacteria, man made dissonance in the airwaves and any other kind of vibrational bombardment we experience. – Animals almost invariably need this remedy because they are deeply affected by the immense amount of man made dissonance in the airwaves. – The Angels encourage all the people and animals at the farm take Golden Armor every day. The Angels explain, ‘Alignment grows increasingly important. As the vibration of the planet increases, things speed up. If you are out of alignment, you feel the consequences sooner. This Essence helps you stay aligned with the divine plan for you. It supports an alignment of your mental, emotional, etheric and physical bodies. It helps life force flow better through your etheric body into your physical body. This brings greater energy to your system. – Alignment is an expansive joyful centered experience of life and purpose. It brings a lessening of burdens, an increase of happiness and a palpable feeling of wellness. Black Currant heals and cleanses our etheric/memory body of detritus from seven generations of our ancestors as well as from our past lives. This means we no longer have to carry the baggage of our previous incarnations or our ancestors’ baggage but are free to regain an unparalleled level of energetic vitality. Bloodroot acts as a very powerful beam of light that cuts through the surface muck of our family of origin’s ego driven patterns to illuminate the family’s divine wisdom. When we know these divine strengths, it is easier to disentangle from our family of origin’s ego driven behaviors and release ourselves from any belief in personality driven familial judgments or counterproductive familial habits that have colored our lives. Instead we can experience ourselves as children of God, free to use our earth family’s strengths while releasing the family’s illusions and personality driven patterns. This combination mix helps us go to our hearts and take the messages of our hearts with the utmost seriousness. Yes, this Essence is for vitality in the regular sense of the word, the power to keep on living. It contains many great Essences to help us feel zippier. More importantly, it is an Essence to support us hear our hearts’ every message more clearly and help us have the strength to follow its impeccable wisdom. – Our hearts are a matchless place of wisdom existing outside illusion even though they are here with us in form. By centering us in our hearts, this mix helps us not to lose tract of the eternal verities of life. This is a very significant Essence for all issues of pain management. Its pure, perfectly formed blossoms springing from a misshapen fruit speak to its ability to transform painful situations into transcendent ones. Consider this Essence for any situation in which pain has obscured the divinity, and you want help to know that nothing is real but God. This remedy helps to ease and release anxiety and anxiety-based behaviors including but not limited to nervous habits, anxious or obsessive behaviors such as excessive licking or feather picking, fear of people or being handled, phobias, confused thinking, fear of loud noises including thunderstorms, anxiety during car travel and overactive watchdog behavior including pacing. Animals as well as many people especially children act as sponges, absorbing negativity wherever they go. It is easy for this group to collect too much negativity and get electrically overcharged. If they cannot find a way to discharge this negativity constructively, they will do it destructively. They often need support to release this electrical overcharge. This remedy helps them discharge electrical overcharges in a benign way. – Consider this one for outbursts of any kind in animals or people. – Addresses issues of aggression, outbursts of a violent or inappropriate nature such as temper tantrums, behaviors that are unexpected, out of character or unacceptable. – Helps curb any unproductive release of pent up emotions through destructive physical activity by moving the energy out of our systems in alternative ways. – Helps people hold their tongues and animals refrain from biting. – Helps with explosive body reactions including skin eruptions, rashes, inflammations, headaches or fevers. Rain of Gold is a veritable flood of wisdom about abundance. Abundance is a natural condition of being. Abundance is offered to us in an abundant number of ways in an abundant number of situations. Rain of Gold tunes us to this truth and helps us experience this abundance more, well, abundantly! – Helps dismantle a scarcity mindset. – Helps to remove blockages from our energy system that might try and tell us it is not spiritual to have abundance flow into our lives.